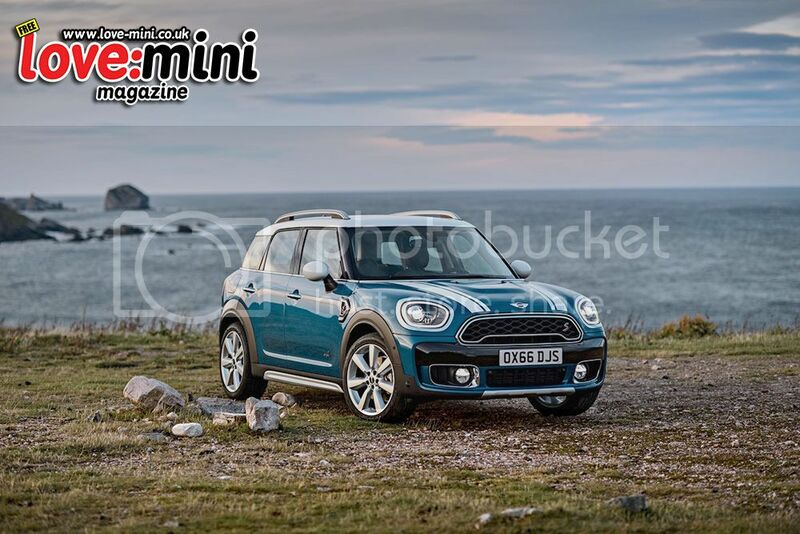 The new MINI Countryman is the biggest and most versatile model to be launched in the brand’s 57-year history. With its larger external dimensions, and increases in space throughout the cabin and luggage area, it offers occupants even greater comfort and a genuinely premium ambience. Useful new features such as electric tailgate control with touch-free opening and unique options, including a fold down picnic bench at the rear, add to the ownership experience. The Countryman’s on- and off-road ability is readily apparent throughout its design, which fuses familiar MINI styling with the tough look of a crossover thanks to the extended ground clearance, large wheel arches and short overhangs. For the first time MINI is offering a plug-in hybrid model with the new MINI Cooper S E Countryman ALL4. Drawing from expertise gleaned from across the BMW Group, this new hybrid features a turbocharged petrol engine and an electric motor, reducing fuel consumption to 134.5 mpg yet also enabling a 0-62 mph time of just 6.9 seconds. The rest of the new MINI Countryman line-up is powered by an all-new range of engines sourced from the latest MINI TwinPower Turbo generation, offering outstanding performance and efficiency. With between 136 – 192 hp and 220 -400 Nm of torque, the new MINI Countryman can sprint from 0-62 mph in as little as 7.2 seconds, while fuel consumption reaches 64.2 mpg and C02 emissions drop as low as 113 g/km. The new MINI Countryman is available with both manual and Steptronic gearboxes and with front- and all-wheel drive. The latter, MINI’s ALL4 system, has been further refined for increased driving agility and efficiency. Reflecting customer demand for high-end features, equipment levels on the new MINI Countryman have been bolstered versus the outgoing model. Additions to the standard equipment list include MINI’s acclaimed Satellite Navigation System, Bluetooth, Cruise Control, Emergency E-call and Active Guard among others. Naturally, being a MINI, there is broad scope for owners to personalise their new Countryman, with extensive colour and trim options, advanced technology features and a range of option packs that offer carefully selected items with significant cost savings for the customer. One such option is a new 8.8” inch touchscreen display as part of the MINI Navigation System XL, offering touchscreen multimedia and navigation control for the first time in a MINI. The new MINI Countryman is available to order at MINI retailers nationwide today starting at £22,465 for the Cooper Countryman, with the first UK deliveries in February 2017. Prices for the plug-in hybrid model will be announced in due course. The new MINI Countryman is some 20 centimetres longer than its predecessor and three centimetres wider, while its wheelbase has been extended by 7.5 centimetres. These enlarged proportions – making it the largest of any MINI on sale - form the basis of a new design that has both the unmistakable MINI aura and the additional presence borne from an extended ground clearance and specific off-road design details. For example, the standard-fit roof rails in satin-finished aluminium are combined with silver-coloured side sill tops, thereby lending greater visual emphasis to the car’s height. The familiar ‘floating roof’, large headlamps and hexagonal radiator grille are all present, albeit having undergone careful evolution. From the front, the headlamp units differ from other MINI models by having an asymmetric shape, with LED lighting now an option. And at the rear, the vertically arranged light units help create the family ‘look’. The second row of seating now contains three fully-fledged seats, and the rear door openings have been enlarged, enabling easier entry and exit. In addition to overall interior width, leg space is now significantly more generous too, with an extra five centimetres of knee room over the previous model. The rear seats can be shifted back and forth by up to 13 cm, prioritising either passenger legroom or boot capacity depending on the situation. The folding rear backrest offers a 40 : 20 : 40 split and also provides a variable tilt angle so as to also offer either increased seating comfort or additional storage space at the rear. The new model also benefits from more storage for on-board items and increased overall cargo capacity both with the seats in position and when lowered. In both the front and rear doors there are pockets that hold one-litre beverage bottles and the centre console extending up to the instrument panel has an integrated storage compartment and two cup holders in front of the gear or selector lever. The MINI Controller and the switch for the electrical parking brake are also positioned on the centre console. The luggage compartment volume is 450 litres and can be extended by folding the rear seats to a total of 1,309 litres. This constitutes a maximum increase of 220 litres as compared to the previous generation model. The luggage area can be accessed via an optional electric tailgate with touch-free opening and closing possible in conjunction with Comfort Access. The optional storage package comprises a variable load floor, lashing eyes and tension straps and also a stainless steel insert on the loading sill. One unique option is the Picnic Bench – a flexible surface that folds out of the luggage compartment and provides seating for two people. The new MINI Countryman is available at launch with a choice of four new engines: two petrol-powered variants and two diesels. In addition, for the first time there will be a plug-in hybrid MINI, the Cooper S E Countryman ALL4 (see below). The new EU6-compliant MINI TwinPower Turbo engines are familiar from the other recent additions to the MINI family. The petrol engines, a 1.5-litre three-cylinder in the Cooper Countryman and a 2.0-litre four-cylinder in the Cooper S Countryman, feature turbocharging, direct fuel injection with centrally positioned injectors, variable camshaft control on the intake and exhaust side (double VANOS) and fully variable VALVETRONIC valve control technology. The result is 136 hp and 220 Nm of torque in the Cooper, which enables a 0-62 mph time of 9.6 seconds and fuel consumption and emissions figures of 51.4 mpg/126 g/km. The Cooper S produces 192 hp with 280 Nm of torque, and completes the sprint to 62mph from rest in just 7.5 seconds, yet still manages 45.6 mpg with 141 g/km of C02 emitted. The 2-litre diesel engines in the MINI Cooper D Countryman and MINI Cooper SD Countryman both also feature MINI TwinPower Turbo technology, with high pressure common rail injection. The 150 hp / 330 Nm engine in the Cooper D enables a very competitive 0-62 mph time of just 8.9 seconds (considerably quicker than the previous model) but with 64.2 mpg and 113 g/km of C02 emitted. The high performance Cooper SD Countryman features 190 hp and a full 400 Nm of toque, providing a 0-62mph sprint of just 7.7 seconds but with 61.4 mpg and 121 g/km of C02 emitted. MINI Cooper Countryman: 3-cylinder petrol engine, capacity: 1 499 cc, output: 100 kW/136 hp, max. torque: 220 Nm. MINI Cooper S Countryman: 4-cylinder petrol engine, capacity: 1 998 cc, output: 141 kW/192 hp, max. torque: 280 Nm. MINI Cooper D Countryman: 4-cylinder diesel engine, capacity: 1 995 cc, output: 110 kW/150 hp, max. torque: 330 Nm. MINI Cooper SD Countryman: 4-cylinder diesel engine, capacity: 1 995 cc, output: 140 kW/190 hp, max. torque: 400 Nm. For the first time a MINI is available with a plug-in hybrid system, achieving outstanding performance with extremely low consumption and emissions. The new MINI Cooper S E Countryman ALL 4 draws on the expertise in this area from across the BMW Group, including the range of BMW iPerformance vehicles. A three-cylinder turbocharged petrol engine with MINI TwinPower technology, producing 136 hp and 220 Nm of torque, powers the front wheels of the Cooper S E Countryman. This engine is combined with a six-speed Steptronic transmission. The rear wheels are powered by a synchronous electric motor housed under the floor of the luggage compartment. This motor offers 88 hp and 165 Nm of torque, with all of the torque available from zero rpm. The motor’s output is sent to the rear axle via a two-stage single-speed transmission. The lithium-ion battery is positioned directly in front of the electric motor underneath the rear seat. It is made up of five modules, each comprising 16 battery cells. Like the electric motor, the battery is produced at the Dingolfing plant, the BMW Group’s competence centre for eDrive technology. The high-voltage battery has a capacity of 7.6 kWh. At a wallbox with a charging capacity of 3.6 kW it can be fully charged in 2:15 hours, while charging at a regular household socket takes 3:15 hours. The intelligent energy management system, controlled by the power electronics of the plug-in hybrid system, ensures that the interplay between the combustion engine and the electric motor is optimised for both driving fun and efficiency in all situations. Using the power of the electric motor alone, the MINI Cooper S E Countryman ALL4 is able to provide locally emissions-free driving, and in the event that more intense acceleration is required, the electric motor supports the combustion engine via a boost function. A total system output of 224 hp and a combined torque of 385 Newton metres are available, enabling 0-62 mph in just 6.9 seconds. Fuel consumption and C02 emissions are very low, with 134.5 mpg and 49 g/km respectively, and the Cooper S E Countryman can travel up to 25-miles on electric power alone. Via the eDrive toggle switch, the driver can also influence control over the interaction of the power units. There are three operating modes: Auto, Max and Save Battery. In the standard setting AUTO eDRIVE, the vehicle runs on electrical power only up to a speed of 50 mph. At higher speeds and in the case of very intensive loads, the combustion engine is automatically enabled in addition. In MAX eDRIVE mode the vehicle is powered by the electric motor alone at speeds up to approximately 78 mph. Finally, the SAVE BATTERY mode can be selected so as to relieve the capacity of the high-voltage battery or raise its charge state to at least 90 per cent so that sufficient electrical power remains for locally emissions-free driving later on. With route guidance activated on standard specification navigation system, MINI Cooper S E Countryman ALL4 uses an anticipatory energy management system to ensures that appropriate sections of the route are run on electric power alone. The high-voltage battery is housed underneath the slightly raised rear seat, as is the 35-litre fuel tank. When all seats are in use, the luggage compartment volume in the MINI Cooper S E Countryman ALL4 is only slightly less than in the conventionally powered models. The connection for the charging cable is under a flap in the area of the left-hand side scuttle. This particular model is distinguishable by the model-specific “e” badge on the side scuttles, and also a yellow “S” in the model inscription on the rear as well as on the radiator grille and doorsill finishers. At the rear, a JCW aerodynamic rear bumper features a single exhaust outlet. Inside, the cockpit includes a yellow start/stop unit at the centre of the toggle switch panel and a performance display in the instrument cluster on the steering column. The MINI Cooper S E Countryman ALL4 comes as standard with the MINI Visual Boost Radio featuring a 6.5-inch colour screen in the central instrument. In addition to the MINI Country Timer, this also displays information such as the charge state of the high-voltage battery and operating mode of the hybrid drive selected by eDrive toggle switch. In conjunction with the optional Media package including MINI navigation system XL, operation is via an 8.8-inch screen with a new graphic design and touchscreen function as well as via the Touch Controller in the centre console. MINI Cooper S E Countryman ALL4: 3-cylinder petrol engine, capacity: 1 499 cc, output: 100 kW/136 hp, synchronous electric motor, output: 65 kW/88 hp, system output: 165 kW/224 hp, system torque: 385 Nm. MINI’s all-wheel drive system, ALL4, is available as an option on all engine variants. This latest version of the system not only reacts quickly and precisely to changing situations, it is also compact and offers a high level of internal efficiency. It consists of a power take-off unit integrated in the front axle differential, a propeller shaft leading to the rear axle and a hang-on clutch that ensures precisely measured transmission of the drive torque to the rear wheels. The system's electronic control is interconnected with the Dynamic Stability Control DSC, so it detects any need to adapt power distribution early on. In this way, ALL4 optimises both traction and stability in adverse weather and road surface conditions, as well as ensuring improved agility when driving through bends in a sporty manner. The advanced suspension of the new MINI Countryman combines the well-proven principle of a single-joint spring strut axle at the front and a multilink rear axle with a design that is optimised for weight and rigidity as well as with a set up specific to this model. Servotronic steering, powerful brakes and Dynamic Stability Control DSC form part of a highly developed chassis package. Dynamic Damper Control is an option: two program maps can be activated for the electronically controlled dampers via the likewise optional MINI Driving Modes. A rotary switch at the base of the gear or selector lever enables the driver to select a set-up according to one of the three modes - MID, SPORT and GREEN. This also influences the accelerator pedal and steering curve, the operating mode of electrically powered comfort features and the engine sound and shift characteristics of the Steptronic transmission, depending on engine and fittings. In addition to a strong but weight-optimised monocoque construction and a full complement of airbags, the standard and optional driver assistance systems are a key factor in improving occupant safety. The standard collision warning with city braking function can be extended to include the Driving Assistant system with camera-based active cruise control, pedestrian warning with initial brake function, high beam assistant and road sign detection. In addition to this, Park Distance Control, rear view camera, Parking Assistant and Head-Up-Display are also optionally available. 75% of customers who purchased the outgoing MINI Countryman model in the UK selected a Pepper, Chili or Sport pack for their vehicle. Reflecting customer demand for high-end features, MINI has significantly raised the level of standard equipment offered on the new Countryman, with many features previously included in the ‘Pepper’ pack on the outgoing MINI Countryman now offered as standard. Highlights include 16” alloy wheels on Cooper and Cooper D models, rear parking sensors (PDC), MINI Connected and Bluetooth connectivity. MINI Cooper S and Cooper SD Countryman models add 17” alloy wheels and cloth/leather upholstery. All models in the MINI Countryman range now benefit from Satellite Navigation as standard. The standard entertainment system is the MINI Visual Boost Radio featuring a 6.5-inch colour display in the central instrument. Bluetooth hands-free telephone facility and satellite navigation are also both standard on the new MINI Countryman. Options include the Harman Kardon hi-fi speaker system and the MINI navigation system XL, which comprises not just the Touch Controller on the centre console but also an 8.8-inch colour touchscreen in the central instrument with a new graphic design. Another new feature offered as standard is the MINI Country Timer. This fun feature registers all travel over sloping, uneven, un-surfaced and snow-covered roads and tracks. As soon as the new MINI Countryman moves on demanding terrain, the type and extent of the challenge are detected and shown on the display in the central instrument by means of graphics. The driving situation is analysed based on data supplied by the control unit of the Dynamic Stability Control function. Owners can progress from the status of “Street Cruiser” to the “Cliff Champ” category, and the icon of the MINI on the display grows to be a MINI monster truck. The program of optional equipment items further includes two-zone automatic air conditioning, a panorama glass roof and a tow hitch with removable ball head. Depending on the engine type, the permitted trailer load is between 1,500 - 1,800 kg. The broad range of exterior paint finishes, seat upholstery types and interior surfaces enables individualisation of the new MINI Countryman in a way that reflects personal style. However, owners can choose to personalise their vehicles further with the aid of MINI’s option packs. These bring together a wealth of optional equipment but with a considerable cost saving compared to buying the items individually. The most popular of these is set to be the Chilli Pack, which for example enjoys a 75 per cent take up rate on the new MINI Clubman. The Chilli Pack includes automatic air conditioning, the MINI driving modes, sports seats (trimmed in part-leather or cloth/leatherette) and LED headlamps amongst a long list of items. The price of the pack is £2,980, but the saving for the customer is £1,150. The JCW Chilli Pack (£4,950/£4,250 for ‘S’ models) includes all of the above plus items such as the JCW aerodynamics kit, sports suspension and 18” wheels. Its price depends on whether it’s fitted to a Cooper or Cooper S model. The Media Pack (£950) includes the MINI Navigation System XL, MINI Find Mate, MINI Connected XL and the Extended phone prep with wireless charging. Meanwhile, the MINI Yours Pack (£2,300/£1,825 for ‘S’ models) brings 19” alloy wheels, leather ‘Lounge’ seats, and a choice from three MINI Yours illuminated facia panels on the dashboard: Chestnut, British Oak or Piano Black. The MINI Teck Pack (£2,090) provides a rear view camera, Harman Kardon hi-fi, MINI Head-up display and the Media Pack XL contents. Finally, the MINI Activity Pack (£850) features the sliding rear seats, the picnic bench and the automatic tailgate amongst other items. New from MINI Connected: personal mobility assistant and MINI Find Mate. MINI Connected now goes beyond the familiar in-car infotainment functions to become a personal mobility assistant. Based on a flexible platform called the Open Mobility Cloud, MINI Connected integrates the vehicle seamlessly into the MINI driver’s digital life via touchpoints such as the Apple iPhone and Apple Watch. At the heart of this connectivity lies MINI Connected, the personal mobility assistant available to MINI drivers with new innovative services as of October 2016. Here, individual mobility planning enables punctual, stress-free arrival at appointments. And mobility doesn’t start in the car: MINI Connected informs the driver of the optimum departure time based on calendar entries and current traffic data. Address data and appointments saved by the driver previously on a smartphone via MINI Connected are automatically transferred to the car and do not have to be entered in the navigation system again. MINI Connected can also save regularly visited places as favourite destinations and it detects frequently covered routes such as the daily run between home and work so as to be able to inform the driver in the event of unexpected traffic delays. Another new feature in the area of connectivity is MINI Find Mate. This forms part of the Media pack and consists of so-called tags with a wireless tracking function that can be attached to frequently used objects and travel items such as bags, cases, key rings and rucksacks. MINI Find Mate is able to track the location of any such objects connected to the system that the driver wants to be sure not to forget: tracking is done not only on the on-board computer of the MINI Countryman but also on a smartphone. Providing there is a Bluetooth connection with the tag, an acoustic signal can be activated in the car or on the smartphone to help locate the object. If the tag is outside the Bluetooth range, the driver can be guided to the place at which a connection was last detected.